The MD Trader window maintains default settings that can be modified in its Properties menu. Enable the Show Tooltips property to see a small text description of certain fields when you hover the cursor over them. Note: MD Trader is protected by U.S. Patents Numbers 6,766,304 and 6,772,132. Launches the Instrument Explorer from the MD Trader window to select Product Types, Products, and Instruments (contracts). This is similar functionality provided as part of the Market Explorer in the X_TRADER control panel. The system clock displays the current time according to your workstation. Displays the net changes. Net change is the difference between the last traded price and the settlement price. Displays the total volume traded for that contract. Select a broker, order gateway, and customer using the routing configuration dialog. Note: This field is only available in MultiBroker mode. Tip: Filter the orders displayed in the MD Trader by clicking the triangle in the upper left corner. The triangle turns red when a filter has been applied. When filtered, net position and working orders are displayed only for the selected broker. Select an order gateway and customer using the routing configuration dialog. Tip: Filter the orders displayed in the MD Trader by clicking the triangle in the upper left corner. The triangle turns red when a filter has been applied. When filtered, net position and working orders are displayed only for the selected TT Gateway or customer account. Click the Net Position field to trade out your position. This automatically populates the Order Entry field with your net position. Indicates the order quantity sent to market. After you submit the first trade of the day, this field populates with the value you place in the Default Quantity field. Note: An Invalid Parameter Combination warning displays at the top of the MD Trader window when the quantity entered is incompatible with the selected order default parameters. X_TRADER adjusts the parameters automatically to resolve the issue before the order enters the market. Preset order quantity buttons. To customize a pre-set order quantity, right-click a button. Enter a value using the keyboard, and press Enter. Clears the Order Quantity field. Populates the Order Quantity field after each trade with the value entered in this field. Lets you choose an order type, order template, or algorithm to your apply to your next order. 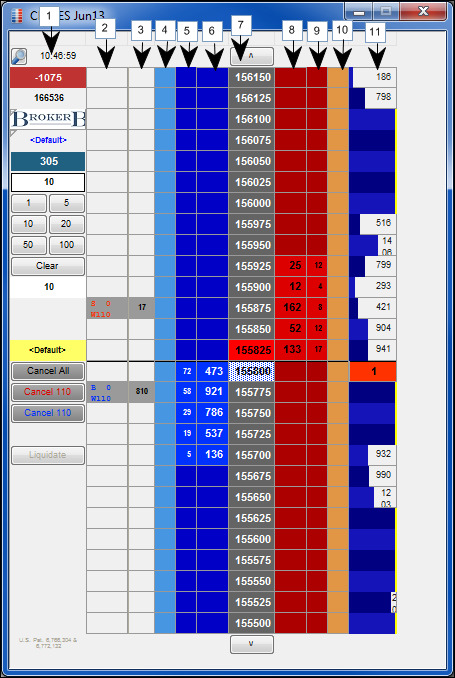 Access the MD Trader Properties menu from the context menu to add more order type buttons. Note: Order templates appear in italics and algorithms appear in italics with yellow border. Deletes all working, held and stop orders for this series of contracts. If an exchange trader uses this feature, all working for that contract for all sponsored proxy traders are deleted. If a TTORD trader attempts to use this feature, it converts one message into to multiple individual delete requests by the client application to prevent a trader from deleting the exchange trader’s working orders (for that contract). Deletes working sells (indicating the number of working sells). Refer to Liquidating a Position. When you use the Liquidate button, MD Trader deletes all working orders on both sides of the market and sends an order that removes you from your position, long or short, regardless of your credit limit. Displays all working quantities (W) and executions (S or B) for an order. Note: If an Autospreader, Autotrader, or algo order has been assigned a color it displays within this column. When multiple Autospreader, Autotrader, algo orders are running at the same price level the color displays as black. Indicates how many contracts are in front of your order at any given price. Refer to Viewing your Estimated Position In Queue. Indicates price settings when you enable the Bid indicator column property. You may paste a value in the column from a spreadsheet. The value of the spreadsheet appears in a white box. X_TRADER highlights the initial indicative price using the Last Trade Price Unchanged color. If the indicative price is higher than that previous indicative price, X_TRADER highlights the price using the Last Traded Price Up color. If the indicative price is lower than the previous indicative price, X_TRADER highlights the price using the Last Traded Price Down color. Note: For information about changing the Last Traded Price colors, refer to the Colors (MD Trader) topic. Displays the number of bid orders associated with the reported market depth. The exact number will display up to 100, after that the number rounds up with an estimate (e.g., 100+, 200+, 300+). Implied orders are included in depth. Inexact values are included when merging implied and direct values. As a result of a merge, the number of orders exceeds the maximum value allowed by TT. Displays current market bids, implied bid outright prices, implied bid spread prices and implieds from implieds bid values. When you enable Keyboard Trading, a colored cursor appears in the Buy column, indicating the current price level for an order. Refer to Keyboard Trading in MD Trader. If supported by the Gateway, the total quantity of resting buy orders displays at the top of the column. Note: For inverted price ladders, the total quantity of resting buy orders displays at the bottom of the column. A yellow line indicates the highest price of the day. A red line indicates the lowest price of the day. A darkened background indicates the prices fall between the high and low. Note: If no other price is available, but you still want to scroll up and down, use the arrow keys on your keyboard. Displays current market offers, implied offer outright prices, implied offer spread prices and implied from implied offer values. When you enable Keyboard Trading, a colored cursor appears in the Sell column, indicating the current price level for an order. Refer to Keyboard Trading in MD Trader. If supported by the Gateway, the total quantity of resting sell orders displays at the bottom of the column. Note: For inverted price ladders, the total quantity of resting sell orders displays at the top of the column. Displays the number of sell orders associated with the reported market depth. The exact number will display up to 100, after that the number rounds up with an estimate (e.g., 100+, 200+, 300+). Indicates price settings when you enable the Ask indicator column property. Indicates the last traded quantity at that price. Also, you can configure this column to display Volume by Price in bar, text, or tool tip format. Indicates orders exist above or below what is visible in the window. Use a mouse to scroll up or down MD Trader. Designates the midpoint of the inside market with a bold black line. Refer to Displaying the Mid-Point of Inside Market.